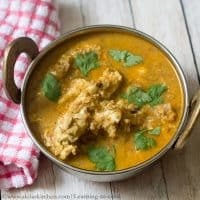 Udaitha Muttai Kuzhambu |odachi oothina muttai kulambu | Egg Poached Curry recipe is really a South Indian delicacy in which, raw eggs are dropped directly in to the boiling kuzhambu. 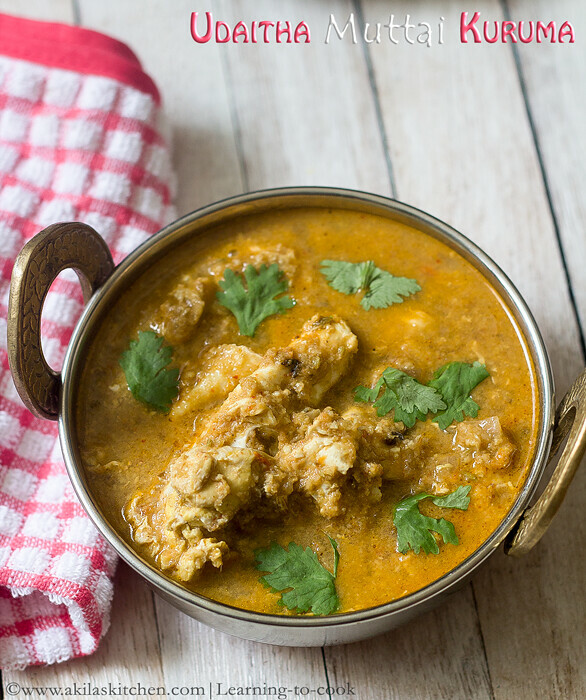 Udaitha Muttai Kuzhambu |odachi oothina muttai kulambu | Egg Poached Curry recipe with easy step by step instructions for your easy understanding and learning. Many people do this Muttai Kuzhambu in various ways. But rather than adding hard boiled eggs to the Kuzhambu I like to break the egg and add it. I feel I love the taste more when info like this… You can see my egg kurma post, for adding hard boiled eggs. Let’s see how we can do the egg poached curry. 1. In a kadai, add oil and when hot, Add the ingredients I and fry for a min. Add the onions and fry till translucent. 2. Add the green chillies and the ginger garlic paste. Fry it till the rawa smell of ginger goes. Addin the tomato and sauté it. 3. Mean while take the ingredients in II to grind and grind to a coarse paste. 4. To this add half of the sautéed onion tomato mixture. Again grind to a coarse paste and keep ready. 5. To the remaining half of the onion tomato mixture in kadai, add the salt, turmeric and coriander powder. Fry for a min. Now add the ground paste and sauté them for a while. 6. Add required water and allow to boil. Add the kurma powder and bring to boil again. 7. When the Kuzhambu starts boiling ( you can see the bubbles in top), slightly reduce the flame and break one egg and add the to the Kuzhambu. Again change the flame the high. 8. Repeat the process for all the eggs and let the Kuzhambu just cook for another 3 min in medium flame after adding all the eggs. Do not allow to boil for more time as the egg tends to break in to pieces. 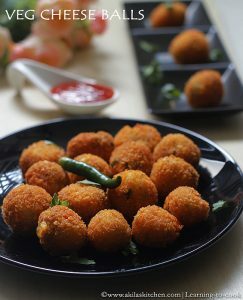 Yummy and tasty Udaitha Muttai Kuzhambu is ready. 1. Never drop the eggs, while the flame is in high, as the bubbles may splash at your hand. Always change to low flame and add the egg and immediately change to high flame. 2. As I said earlier after adding all the eggs do not cook for long time, as eggs break to small pieces. 3. 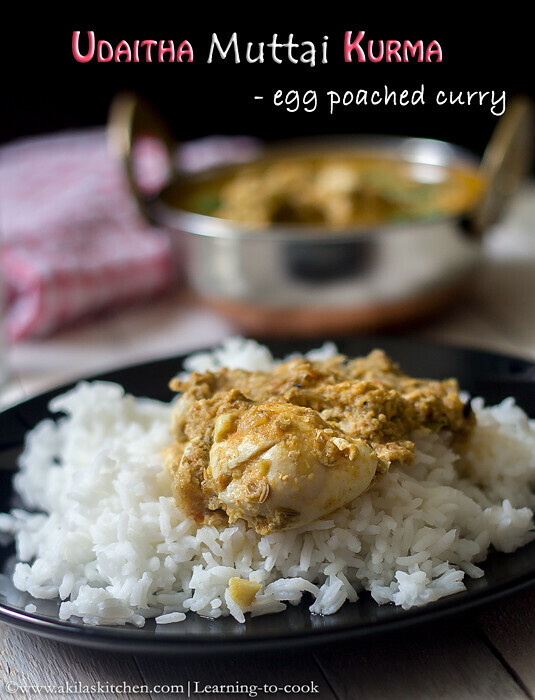 If you don’t like adding eggs directly, you can boil the eggs, make a slit and add the eggs to the Kuzhambu. In a kadai, add oil and when hot, Add the ingredients I and fry for a min. Add the opinions and fry till translucent. Add the green chillies and the ginger garlic paste. Fry it till the rawa smell of ginger goes. Addin the tomato and sauté it. Mean while take the ingredients in II to grind and grind to a coarse paste. To this add half of the sautéed onion tomato mixture. Again grind to a coarse paste and keep ready. To the remaining half of the onion tomato mixture in kadai, add the salt, turmeric and coriander powder. Fry for a min. Now add the ground paste and sauté them for a while. Add required water and allow to boil. Add the kurma powder and bring to boil again. When the Kuzhambu starts boiling ( you can see the bubbles in top), slightly reduce the flame and break one egg and add the to the Kuzhambu. Again change the flame the high. Repeat the process for all the eggs and let the Kuzhambu just cook for another 3 min in medium flame after adding all the eggs. Do not allow to boil for more time as the egg tends to break in to pieces. Never drop the eggs, while the flame is in high, as the bubbles may splash at your hand. Always change to low flame and add the egg and immediately change to high flame. As I said earlier after adding all the eggs do not cook for long time, as eggs break to small pieces. 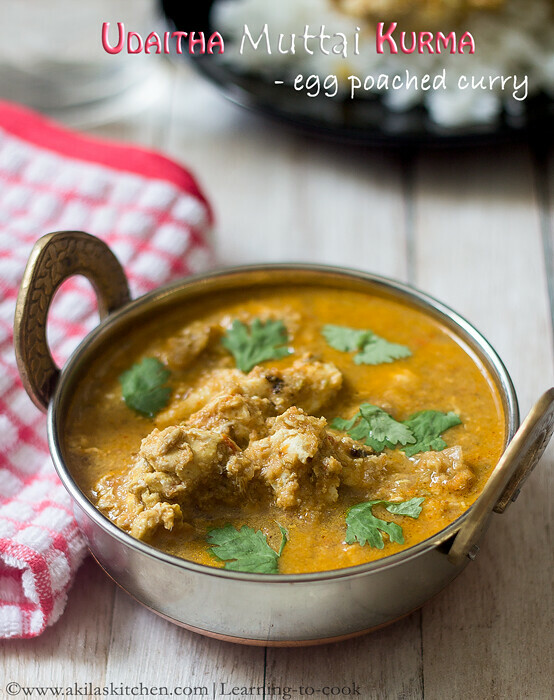 If you don’t like adding eggs directly, you can boil the eggs, make a slit and add the eggs to the Kuzhambu. *Post first published on Feb 27th 2015. Updated with recipe. 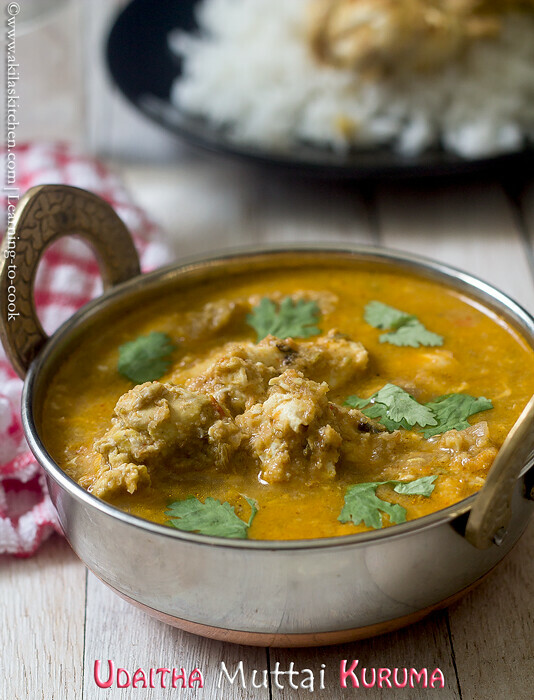 Looks very yummy.. Would love to have this with rice..